DID YOU KNOW there are not one, but two red carpets at the Academy Awards? One for celebs and one for ‘plebs’? At least, that’s how Belfast man and Dublin dweller Michael Creagh remembers it*. In 2011 Creagh found himself walking that very carpet outside the Kodak (now Dolby) Theatre in Hollywood, nominated for an Oscar for his short film The Crush. Amid a whirlwind of personal difficulties, money worries and ambition, he was honoured at the world’s highest wattage awards show for his first ever film, rubbing shoulders with the great and good of Tinseltown. And what happened once he got there? He hung out with Colin Firth (kind of), shared toilet small talk with Jeremy Renner, went to ‘the most Irish party in Hollywood’… oh, and he had to buy his own drink. But how did he get there in the first place? Creagh had been planning on making a film for years, and finally in his mid thirties decided to do something about the “few scripts in the bottom drawer”. His brother, a BBC cameraman, put him in touch with producer Damon Quinn, who was quite taken with a script he’d written for a 15 minute film about a schoolboy who falls for his teacher. Quinn told him how to get real on his budget, Creagh approached the bank, counted up his savings and off they went, making the film with Creagh’s nine year old son Oran as the lead actor. Fast forward a few months and The Crush – after several false starts and knockbacks (Creagh said it “wasn’t even getting into festivals” in the beginning) – had won Best Short at the Foyle film festival, one of only a handful of international festivals with Oscar affiliation. Winning at Foyle and the added bonus of a call to be told the film had been accepted into the Tribeca Film Festival in New York meant that The Crush was then eligible to be considered for an Oscar. It’s not a cheap business though, and with a recent redundancy and the breakdown of his marriage weighing heavily, was there even any point? Between the expense of actually entering things, producing the digital cinema package you need to send, getting DVD copies done, deciding to go to Tribeca… it costs a packet. The day before the Oscars deadline it was all getting on top of him. His car broke down, Fed Ex wouldn’t take a cheque to send his entry to the US, he didn’t have the money, and he just wasn’t going to bother. Producer Damon Quinn told him “you’ve got to find a way”, so he did. The parcel went via Fed Ex just in time, and all there was left to do was wait. A few weeks later, another blow. The Academy got in touch to say that The Crush had been disqualified, that it hadn’t made the cut off date. That was impossible. We’d paid for the package to be Fed Ex-ed overnight. Some more wrangling with the delivery company, proof that the fault lay with them and not with Creagh, and The Crush was in. But would it be nominated? In December 2010 I got an email quite late at night saying that The Crush was in the final ten. Creagh says there wasn’t much left to do except wait until late January, when those ten would be whittled down to five, and the final nominations would be announced at the crack of dawn in Hollywood; just after lunchtime here in Ireland. I didn’t watch it live. I went to a cafe with my girlfriend, we went for a walk on the beach. I tried not to think about it. Creagh describes his massively mixed feelings upon hearing that he’d made it into the coveted final five. You imagine it should be a very warm fuzzy positive thing. In reality, it’s a lot of sheer panic. He describes the elation, but also a sense of being an imposter, of not being worthy of the honour, of not deserving it. Unworthy feelings aside, Creagh was nominated. He was invited to attend the flashiest show on earth. He’d always been fascinated by the Oscars, sometimes staying up all night to watch the live broadcast, taking a day off work the next day so he could really enjoy it. With money worries still very much to the forefront, a grant from Culture Ireland ensured that Creagh and a small team (including producer Damon Quinn, short film distributor Derry O’Brien, Michael’s son Oran and Oran’s mother) could make the trip to LA. Creagh’s brother, the BBC cameraman who’d filmed The Crush, also made the journey. Their father, ill with cancer, couldn’t make the trip. 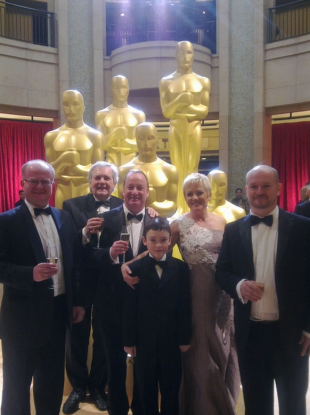 Creagh said the anxiety and uncertainty in the build up to the trip melted away once it finally dawned on he and his family that they were heading to the Oscars and “leaving the stress behind”. Trying to picture the logistics and organisation that goes into getting the thousands of people that attend to Oscars every year into the right place at the right time is the classic definition of a head melter. On a micro level, Creagh said that he received an invite and documentation from the Academy on where and when to show up, and that was about it. The Irish Film Board got in touch about meetings, Culture Ireland held a special event where Michael D chatted with Creagh and co about his plans to run for president, and they all went to a party in Fionnula Flanagan’s LA home. It was like a nice Irish house had been transported to Hollywood. You expect some hallowed home with steel and glass and infinity pools, but really it was just a really nice gang of Irish people and Oscars people having a good time. Somebody – Derry O’Brien probably – had organised for a car to take them to the Kodak Theatre. Creagh remembers ‘battering down the red carpet’, getting through the gauntlet of press and celebrities as quickly as possible. He’s fairly certain they took some kind of ‘B route’ down a secondary carpet, leaving the prime real estate free for the likes of Colin Firth and Natalie Portman. Weaving their way through heavy security checks and “various magic tunnels” they found their seats; not near the front, but not in the nosebleed section either. They were nominees after all. Creagh said he took the chance to take it all in before the ceremony got going. I just thought ‘feck it’, I’m going to take a wee circuit. I went down all the way to the front and passed everyone. I walked straight past Colin Firth in his seat. Firth was the big man on campus that year, with The King’s Speech expected to take home all the main awards. My God this is some production. The ceremony ran like clockwork. In fact it seemed to fly by. If you were in sight of the cameras and left to go to the bathroom or the bar, a seat filler magically appeared to fill your space. Creagh said that some people would vacate their seats for 20 minutes or half an hour at a time, preferring instead to spend time at the bar (where the drinks were NOT free. Not by any stretch of the imagination). I didn’t go up to anyone and ask for autographs or selfies or anything, maybe I should have. Damon got a picture with Jeff Bridges. Creagh said that when his category came and went and he didn’t win, he was kind of relieved. He had felt self conscious, and just wanted the award part to be over and done with, so he could relax. Maybe it’s an Irish sensibility but you’re feeling ‘do I deserve to be here?’. Surely if you’re up for an Oscar you need to be on your tenth film or something. In the blink of an eye the show had ended, and it was over to an Irish Film Board party in an Irish pub. Nothing too fancy. If there had been a few more Irish nominees it might have been a bit more raucous. His highlight? Maybe meeting Pixar and Disney head honcho John Lasseter. Lasseter, who directed the likes of Toy Story and Cars, takes a special interest in short films and sought out Creagh and his son Oran at a special event, telling the nine-year-old that his was his favourite performance by a child that year. Oran hasn’t pursued acting any further just yet, instead showing interest in following in his father’s footsteps and staying behind the camera. Since his nomination Creagh hasn’t made massive any massive strides in the world of filmmaking ”but it’s not for the want of trying”. His Academy Award experience got him an agent, and has opened some doors. He’s still producing scripts, working on pilots, paying the bills with freelance advertising work. Maybe one of these days he’ll be trotting down the ‘A Route’ of the red carpet. He’ll probably still have to buy his own drinks though. Join DailyEdge.ie for live Oscars coverage throughout the night this Sunday. Download our free app here (iOs) or here (Android). Email “'I wore a suit from Dunnes' - one Irish man's trip to the Oscars as an unexpected nominee”. Feedback on “'I wore a suit from Dunnes' - one Irish man's trip to the Oscars as an unexpected nominee”.